There’s a stereotype that millennials are self-obsessed and over-opinionated, but when you work in higher education, you know that’s rarely true. Many millennial students are dedicated to learning all they can about a variety of important subjects and are willing to consider alternate opinions. These, of course, are great qualities. But they do mean that higher education professionals have to refine the way they reach out to millennials, especially when it comes to social media. “Millennials are not unreachable when you take the time to develop an authentic campaign aimed at connecting instead of selling and building brand awareness,” said Joey Kercher, president and CEO of Air Fresh Marketing. Specifically, millennials are looking for four things: authenticity, trust, involvement and validation. When your social media marketing efforts espouse these values, millennials are much more likely to engage with you. From posting pictures of “Pinterest fails” to opening up about struggles with mental health, millennials are interested in communicating authentically. They also want to see that authenticity from the brands (and institutions) they engage with. When you use social media to communicate honestly, that resonates with millennials, and they will want to connect with you. Let’s talk about each of those elements. To be authoritative on social media, you need to be informed about the latest research and share your insights. To be helpful on social media, you need to be engaging with your followers: answering questions directly and indirectly by sharing useful posts from other sources. To show intimacy on social media, let your followers see that there are real people posting! Show faces and stories. Now, divide these three things by self-promotion. The more you self-promote in relation to being authoritative, helpful, and intimate, the less trust you generate from your millennial followers. And vice versa. Millennials want to be actively engaged in your social media actions, not just passively observant. Provide plentiful opportunities for millennials to be involved through social media. Start important conversations, showcase followers engaging with your school in real life, and respond quickly when followers reach out (especially if they have a complaint or question). Have you ever found a great-looking product on Amazon, but then you didn’t buy it because it had no reviews? It was the lack of social validation that made you hesitant to purchase, and the same principle applies to schools. Executing the actions we’ve already described will provide an environment where social (and even personal) validation thrives. Encourage reviews, show faces, and make it a priority to respond quickly. 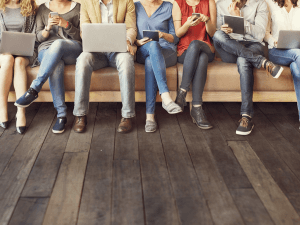 Millennials are sharp cookies, and they’re looking for authenticity, trust, involvement, and validation in their schools’ social media presence. When you’ve achieve these things and see the resulting increase in traffic, it’s time to think about conversion. You don’t just want students and prospective to engage with your social media channels–you want that engagement to translate into real life! HelpSquad’s 24/7 live chat answering service for higher education is here to create personal connections that will translate into real-life, long-term relationships.